Cary Bone - SCI Technology, Inc.
Those who know Cary Bone know that he’s a man of many talents – and projects. As it turns out, some knew it before anyone else. It’s just a guess, but Cary’s grandmother might have been talking about work ethic. In order to be labeled a jack of all trades, a person needs to be working on something – anything, really – almost all the time. That’s a description that evidently fit Cary in the past. And it certainly still fits today. Whether he’s at home in his workshop, or on the job with SCI’s TOCNET team, Cary can usually be found working on – and often mastering – one project or another. Each one is likely to be different than the one before it, from beekeeping, to growing his own food, to wood turning, just to name a few. “I gave some of it to my dad as firewood, but then I thought, wait a minute, I could take some of this firewood and turn that into something useful,” he says. Some of that firewood turned into another project: Antique-style pepper mills carved on a lathe and finished with Cary’s own hands. Not bad for a guy who only took up the hobby last spring – and who also balances out all the projects with family time as a husband and father of two sons. That same resourcefulness translates to SCI, where Cary serves as Support Manager for TOCNET. He’s responsible for coordinating the day-to-day activities of the TOCNET Support team including trade shows, in-house training, on-site training and customer support. 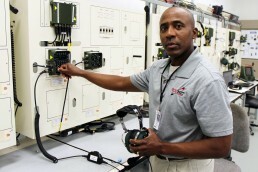 “Cary is a fantastic employee who helps set the standard of a high-quality work ethic that puts our military customers first,” says Kevin Duke, SCI Vice President of Tactical Systems. “In both his personal and professional life, Cary is always pressing himself to expand his knowledge and experience in a wide variety of subjects and activities. He then carries that over to our larger team with a commitment to always improve – enabling us to offer world-class products and support. Top-tier support is especially important with TOCNET, Cary says, because of who uses the product – and why they use it. Of course, providing quality support is a direct function of working with a strong group. Specifically, Cary points to Ken Eichman, John Adams and Greg McClain as “cornerstones” of the TOCNET support team.